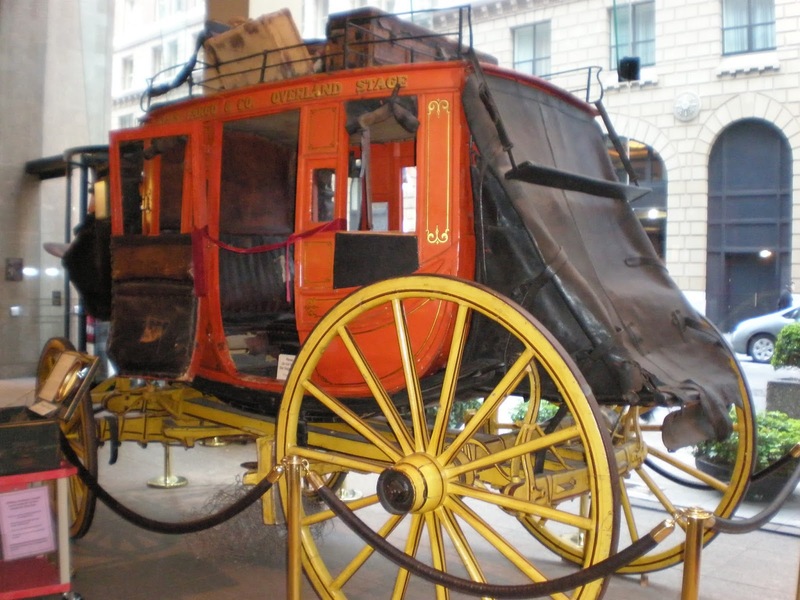 In 1858, The Butterfield Overland Mail stagecoach line opened its Southern Route, a large part of which went through Texas. Its name comes from John Butterfield, who with several associates bid on the western mail route. It was also known as the Oxbow Route, because of the shape of the path it took. This route was convenient for several reasons, including the normally warm and dry weather. It did have its drawbacks, however, including the often hostile Comanche and Apache tribes and long stretches where water was scarce. It was chosen over proposed shorter routes farther to the north because of the promise of year-round delivery. Snowfall was a rarity on this route. At the time, the $600,000-a-year contract was the largest overland mail contract ever awarded in the United States. Most of the stagecoaches used on this route were Concord coaches, made by the Abbott-Downing Company in Concord, N.H. They carried passengers and cargo, along with the mail. The route started in Memphis and St. Louis, converging at Fort Smith, Arkansas. The coaches then entered Texas at Colbert’s Ferry on the Red River. The line swept across northern Texas, dipping down to El Paso on the state’s far western edge, and went on to Los Angeles and San Francisco. The entire route was 2,700 miles long and held 164 stations, at an average of 20 miles apart. Two types of stations lay along the road. At swing stations, the drivers stopped only for a few minutes to swap out their teams for fresh mules or horses. At home stations, the station agent provided meals for the drivers and passengers at about 50 cents a head. These stations were not known for their cuisine—beans, hard tack, beef jerky, and coffee were the staples. Some passengers carried their own food. Several forts were also at or near stops on the route. Texans gladly welcomed the Butterfield Overland. They built bridges and roads to accommodate the stagecoaches and welcomed the passengers and information that flowed in because of the mail run. However, this southern route was used only for a short time. At the outbreak of the Civil War in 1861, Texas seceded from the Union. Federal troops were withdrawn from the area, and the threat from hostile Indians increased. Supplies were harder to come by. The last Butterfield stagecoach eastbound through Texas rolled out of Fort Chadbourne on March 12, 1861, with a Confederate flag flying over the fort. The company rerouted its California run to roads far north of Texas, following well-worn emigrant trails. This became known as the Central Overland Mail Route. It ran along the Platte River from Abilene, Kansas, through Nebraska and Wyoming, with a spur heading south to Denver. In memory of the Butterfield Overland Mail through Texas, I am giving away a copy of Captive Trail, featuring the driver of one of the first stagecoaches in the Fort Chadbourne-Fort Phantom Hill area. This book won the Will Rogers Medallion and was a finalist in both the WILLA Awards and Carol Awards. Commenters may choose a paperback or e-book copy. Be sure to leave your contact information. thanks Susan! Great post and I loved that map. It also makes me wan to read this story! What a perfect cover. I have a soft spot for Arizona and this book makes me think it would be a perfect read for a cool winter day when I need some southern sun. So much that they went through to deliver the mail, and we take for granted our mail delivery now! History like this always reminds me how very blessed we are. :) Thanks for sharing, Susan! I love all things history and this post and the book are delightful. So many stories along that trail. Wow. My imagination runs wild! KarlaAkins (at) KarlaAkins (dot) com. Thanks, Debra! I love your state of Arizona too. Bethany, I know! My grandpa was a rural mail carrier in Maine, and he got to drive a car and ride on a train for his job. Karla, thank you, and thanks for stopping in today. Glad you enjoyed the post, Angela and Deb. Researching my Texas books was a great challenge, but so rewarding! I forgot to say, the winner of Captive Trail will be drawn on Tuesday, June 25. Happy reading! I can't imagine riding that stagecoach for miles and miles as compared to our modern vehicles. I'd say it was a bit of a bumpy ride. Isn't it amazing that the mail got through to its recipients? What a challenge! Thanks for the interesting post. Thank you for the wonderful post. I always enjoy reading about these times. It's amazing to learn what the pioneers went through. Thank you for entering me in your giveaway. I think you are right, Kay, though I believe that on the Concord coaches, the body swung on leather straps, so there was at least a little shock absorption. Thank you, Barbara. I am so glad I live NOW--but I love learning about the good old days! Thanks for this post today Susan, wow this was a long way to travel by stagecoach, I cannot even begin to imagine how hard that must have been back in those days. I would love to read your book Captive Trails.. I don't think I would ever want to take a stagecoach for that far! I like my air conditioning and smooth ride. :) Great post! I do think I'd get tired of it too, Paula. And Susan, so true--without air conditioning and other conveniences, how long would we last? But I guess if we were desperate to get to California, we'd put up with a lot. Would love to win this book. This is all very interesting! I'd like a paperback please, if I'm fortunate enough to win! I wonder how often they changed drivers and what did they do for sleep? I have to agree that I'd not do well w/o air conditioning. Yuck!! Bless those driver's hearts. Thank for an interesting post and the chance to win Captive Trail. I didn't know all of this. That was some mail contract the Butterfield stage landed. Thanks for the interesting post! Thanks, everybody. As to the drivers, if I recall correctly from my research, each one had a certain number of sections they would drive on the route, maybe four or five stages between stops. Then they would sleep a night or two at one of the home stations and then drive back in the opposite direction when the next stagecoach came through, depending on the schedule. The passengers had to sleep (if they could) while riding. Not the most comfy accommodations, but if you wanted to keep moving and get to your destination, that's what you did. We are so spoiled with modern transportation that it's easy to forget what people went through to travel in the past! I think that's one reason I enjoy historical fiction so much... so I don't forget. :) After my daughter graduated and moved out, I had a greater appreciation for parents/families who said goodbye to daughters/family members leaving on covered wagon... not sure when they'd hear from or see that loved one again. I am truly thankful for modern technology. I look forward to reading this book! Thanks, Maxine! Cyndi, you are so right. Now we complain at the least little thing. And as for those daughters leaving, don't get me started! I've got one in Idaho. She didn't go by covered wagon, but I do understand what you're saying. And the winner of Captive Trail is Bethany! Congratulations, Bethany, and thanks to all who took part.